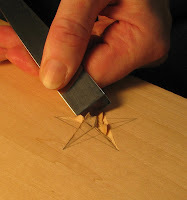 To carve a star, follow the basic principles in lettercarving. For this technique, you only need a straight chisel and a mallet (not even a mallet, if you push hard enough to make your stop cuts). And you'll make life easier on yourself if you create a star where any two points share a common wall—a straight line drawn from point to point. In the illustration above, the dashed lines are low spots, the valleys, where you will make the stop cuts. This star is 1.875" diameter, so I'm using a 20mm straight chisel: small enough to manage but large enough that the width of the blade is wider than the deepest cut and almost as wide as the stop cut is long. First, define the stop cuts. They should not be deep as the final depth of cut and should taper to nothing at the star's points. 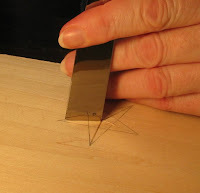 Bevel up, start at any point and ease the chisel into the cut, gradually slicing deeper as you reach center, then easing up again as you approach the opposite point. Here is the advantage of two points sharing a common wall: with one cut, you have established one of the two walls on each of two spurs of the star. Keep an eye on the grain direction to avoid tearout and work your way aroun d the star. You should not try to remove the waste in one slice, but ideally two (I've never mastered this). With subsequent passes, be sure to lay the chisel's back flat against the wall created in the first slice to ensure a clean, single facet, wall. Remove stubborn pieces by continuing the slicing method and/or by sliding the chisel directly downward into the valleys. In the photo at right, you can see tearout on the upper right spur. Slicing with the grain is most difficult and tearout means you should cut in the other direction. I cleaned it up fairly well with very light paring slices. Not perfect, but no one will inspect your work as closely as you (or another woodworker!) will. If the spurs do not meet in the middle, that means the walls' angles are not consistent and you'll have to carefully pare the shallower walls to match the sharpest-angled walls. 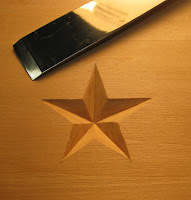 I'ts easier than you might think to carve a star, but it's a design element that prompts admirers to say "nifty!" Nicely explained, and nicely executed. 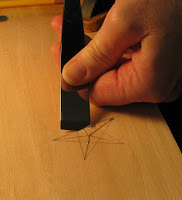 I recall you mentioning that you are more comfortable with letter-carving procedures than chip-carving procedures, but have you tried making a chip-carved panel before? You might find it interesting. It can get tedious at times, but like so many other things it's easy if you tools are sharp enough. Mike, I have tried chip carving (only a little—never an entire panel) but am not able to get as good results with it. I may just need to keep practicing. Chip carving is a fun way to while away the time. 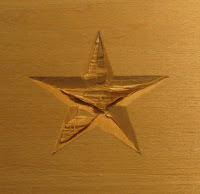 I never tried chip carving before, but I have been wanting to do a small box with some chip carving on the top. 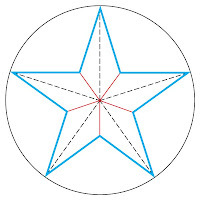 The star would make a nice center. Glad your doing well, been reading your blog for a long time and I really enjoy it. Joey, you can definitely carve that star with a chip carving knife. Good luck with your box! I think you deserve a star for your star! How's the healing. Is you Ninja being good to you? And heck no, I'm not asking the ninja for anything---she has a SWORD, you know! Woodbloke, what a great movie! Sylvia saw your site for the first time today. I wanted to show her the star you made. Mind you, I've never said anything about this to her. Her first words, seeing the photos. "Wow, she has really nice nails!" I just busted up laughing. Excellent web site. Could you tell me what make of chisels/gouges you use?. I now want to learn carving! Woodchippy, all of my carving chisels come from www.woodcarverssupply.com and I only use Lamp Brand. If you notice, the straight chisels only have one bevel and are very thin. That helps with this type of carving (the slicing method). thanks for the advice, i'll be looking to get a couple now! Great post. I just spent 10 days in ME on vacation and in an effort to control my shop withdrawal I took along some chisels and some basswood to start to learn how to carve. I did try chip carving and came up with some passable rossettes, but like you I really like using the traditional chisels. Mostly I have just done natural items like flowers and leaves because I can fudge the lines, but I will give this star a try. Thanks for the inspiration. What a great little tutorial! I'll definitely have to give that a go. Be careful if you order from woodcarverssupply.com. They have been an immoral company. Wood carvers supply has treated us poorly.